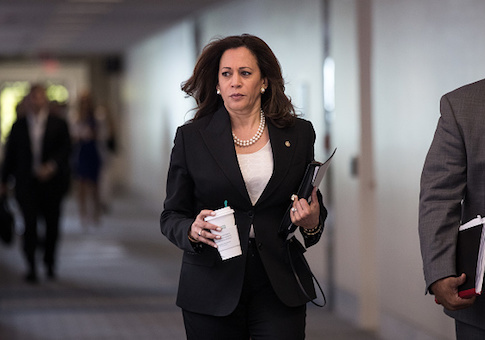 Sen. Kamala Harris (D., Calif.), a potential 2020 presidential candidate, signed a recent email solicitation for Organizing for America, the grassroots arm of Obama for Action, President Barack Obama's former campaign committee. In the email, Harris asks individuals to step up and fight back against the Trump administration on behalf of DREAMers. "There are 800,000 immigrants in the U.S. known as DREAMers — young people who were brought to America as children and know this country as their only home — whose futures are under threat," the email reads. "They've been put at risk by an administration that is reportedly on the verge of ending the Deferred Action for Childhood Arrivals (DACA) program that shields these young people from deportation," it reads. The email encourages individuals to sign up for Organizing for America, linking to a contribution page for the organization. "I am going to do everything I can in Congress to protect them," the email states. "But this has to be a larger fight — if you showed up to the Women's March, or fought back against the Muslim travel ban, or made yourself heard in the fight to save Obamacare … we need you." Harris has garnered considerable media attention as a potential Democratic contender for president in 2020. The California senator has added a number of former Hillary Clinton campaign staffers to her D.C. congressional offices, and has also spent hundreds of thousands on the firm that was responsible for boosting Sen. Bernie Sanders' (I., Vt.) profile during the 2016 Democratic primaries. In recent months, Harris has mingled with former top donors to Clinton in the Hamptons while attending dinners with Hollywood power players. The senator's campaign committee is additionally renting office space from a travel agency located just a few minutes away from the Capitol building in Washington, D.C. This entry was posted in Politics and tagged 2020 Election, Barack Obama, Kamala Harris, Obama Campaign, OFA. Bookmark the permalink.